It was no secret that Abdul was a sideways cyclist. That’s not a euphemism; incidentally, it’s a sentence with a perfectly literal meaning. Some people found this tendency fascinating – mainly strangers and onlookers and people with too much time on their hands. Other people found it more upsetting than fascinating – generally members of Abdul’s family, who wore his welfare close to their hearts. “You’re sitting on it the wrong way,” his mother would exclaim, worried he might accidentally slip and pierce his manhood on a spiky bit. She was very much looking forward to the day she had grandchildren to play with, so the relevant areas remaining intact was of utmost importance to her. “How are you staying upright?” the local children would ask, because it seemed to them he was operating in total disregard for the laws of physics by remaining perched on the frail two wheeled frame, cup of tea in hand. “That would be telling,” he would tell them, tapping the side of his nose slyly. It was around that time Abdul decided to attach the cart to the back of his bike. He chuckled grimly as he lashed the towrope around the mudguard. As the saying goes, if a child kicks a bicycle stand the rider may fall – but if a child kicks a big wooden cart, it is they who get the broken toes. There was never any question of his parting company with the bicycle, in spite of all the protestations at his cycling style. The two of them had been together a long time, and Abdul could no longer imagine life apart from his trusty steed. When first they met, the bicycle had been abandoned and lost in an alley near his father’s hospital. It had a flat tyre and the frame was dented, but other than that it was perfectly fine. The bicycle said nothing in reply, for bicycles cannot talk, but it went with him willingly enough and allowed itself to be mended over several cups of sweet tea and protestations from Abdul’s mother. When Abdul married, the bicycle lived side by side with his wife’s own bicycle, and he liked to imagine they got along together very well. Abdul had a whimsical side to him, as evidenced by the opening line of this story. All of this had happened before the earthquake, of course. Abdul generally tried his best not to think of the quake, because the only way to move on is to look forwards instead of back… But it was hard to keep it completely out of mind, and sometimes memories would come to him unbidden. The worst was that image of little fingers reaching through the rubble. People said it was lucky that he hadn’t been home at the time, but they didn’t really mean it. A man who outlives his wife and children only to become homeless and jobless is not exactly blessed by good fortune. Still, it doesn’t do to dwell on these sorts of things. Abdul had developed ways of keeping himself occupied since his personal tragedy, and one of these was a vigorous return to the sideways cycling he had practiced as a younger man. And so it was that the rickety bicycle and cart with their strangely sideways rider were a common sight in the city. They even featured in some of the guidebooks for lazy tourists, the ones that tell you in painstaking detail everything you should do so that you never have to think or explore for yourself. These tomes even contained some of the many theories as to how he did it. ‘Sheer strength of will’ was one popular option, as were ‘witchcraft’ and ‘secret robot’ – although the Lonely Planet guide seemed to think this last one was just a bit silly. For his part, Abdul could never explain how it worked. It was enough for him simply to navigate the dusty streets whilst people walked alongside, offering pleasantries and cups of tea. He never drank anything else, for there is no better beverage to drink when hearing snippets of other people’s lives, and his teeth were the soften golden brown of tannin. There are several requirements for the successful sideways cyclist. It takes a lot of flexibility, not to mention strength of will that 98% of people simply do not have. 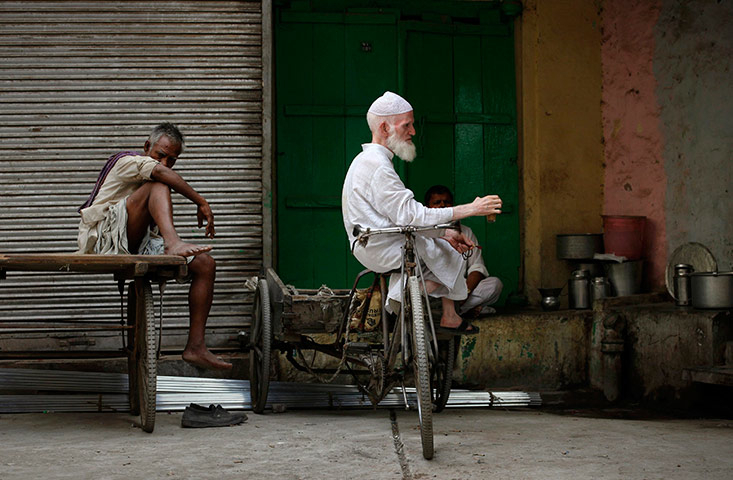 There were some days when even Abdul himself could not reach the correct mental state to achieve his goal, and however many cups of tea he drank he would simply pull his muscles and dislocate his kneecaps when he tried to cycle sideways. The rickshaw driver agreed that this was probably the case, but added that sideways cycling was not for everyone, and that Abdul was probably a little too advanced in years to be trying it out. Abdul smiled a polite smile that let it be known he had been doing this before the rickshaw driver was even a glimmer in his uncle’s eye, and determined it was time for a rest.